Hungry at home and need a quick meal? Well the kids are running around and need your attention, and you don't have enough time to cook some hot meals while you're bored with eating sandwich. 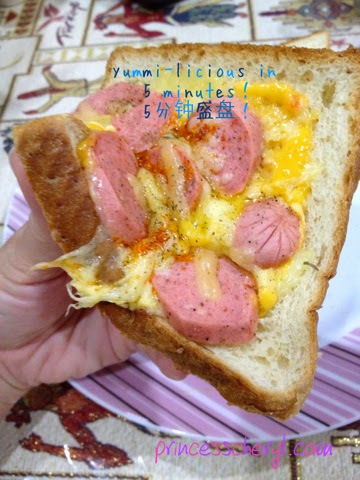 Bread, grated cheese, sandwich spread, sausage, spices and mixed herbs. And of course you will need your microwave oven or stove. 1. Apply a layer of sandwich spread over your bread. Then top with a generous amount of cheese - Cheddar/Mozarella/Parmesan. 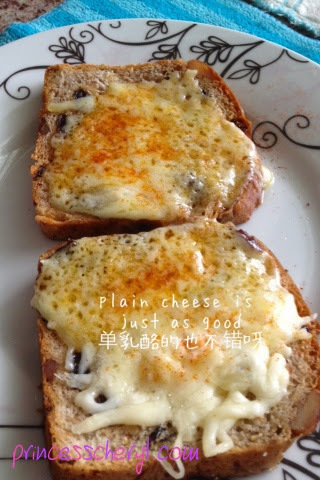 I normally use grated cheese plus Mozarella. 2. 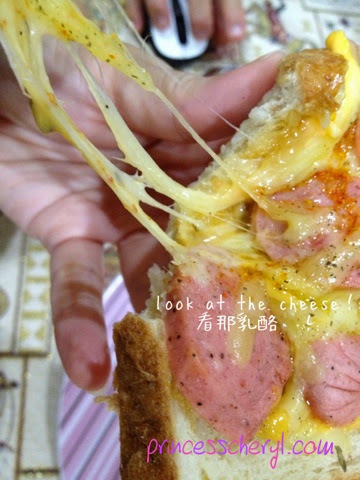 Slice the sausage and add on to the cheese. Too up with more cheese to cover the surface. You may add the toppings per own preference - capsicum, mushroom, etc.. Or even replace the sausage with ham, bacon, tuna chunks, sardine, etc..
*Sausage is not a healthy option especially for toddlers, suggest to totally exclude it or replace with other ingredients. 3. Sprinkle with paprika/chilli powder and mixed herbs if you like. 4. 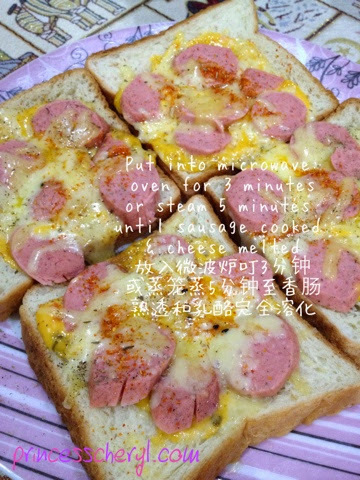 Microwave for 3 minutes. Healthier option for toddlers will be by steaming for 5 minutes or more, until toppings are cooked and cheese melted. *Depends on the amount of pizza you make. I have also tried just 1 slice and it only needed 30-40 seconds in the microwave. 5. Ready to serve! All done around 5 minutes. For toddlers you may go plain. It's just as good isn't it? Well you may as well exclude the chilli powder. These were for ourselves as supper. I love doing these small pizzas! especially when I do this with the kids!